BACKGROUND AND PURPOSE: Most cement leaks during vertebroplasty are asymptomatic, but pulmonary cement embolism has been reported to cause cardiovascular disturbances and even death. Adding hydroxyapatite (HA) to polymethylmethacrylate (PMMA) cement to reduce the quantity of barium may aggravate cardiovascular deterioration in the event of cement embolism by activating coagulation. Thus, we investigated the cardiovascular changes after pulmonary cement embolism of PMMA with and without HA. MATERIALS AND METHODS: In 13 sheep, cement (2.0 mL) was injected into the pulmonary trunk. Two different cements were used: 1) standard PMMA and 2) PMMA with 10% HA (PMMA & HA). Arterial, central venous and pulmonary arterial pressures, heart rate, and cardiac output were monitored continuously until 60 minutes after the injection. Blood gases and coagulation parameters (antithrombin, D-dimer) were measured before and after injection. RESULTS: Mean pulmonary arterial pressure had increased by approximately 9% (PMMA) and 14% (PMMA & HA) 1 minute after injection and stayed elevated. There were no significant differences between the groups. No evidence of thromboembolism was detected. CONCLUSION: Cement embolism did not result in clinically significant pulmonary arterial hypertension. Adding HA to PMMA cement did not cause more severe cardiovascular changes. The main complication during vertebroplasty is leakage of cement into adjacent structures, which occurs in 41% of augmented vertebrae.1 These leaks are mostly asymptomatic, but potential consequences are spinal cord or nerve root compression,2–4 and respiratory and cardiovascular deterioration.5–7 Approximately 2% of the observed leaks are pulmonary emboli; pulmonary cement embolism occurs in 0.6% of augmented vertebrae.1 The reported incidence of pulmonary cement embolism is not very reliable because more leaks are detected when CT is used.8,9 Furthermore, patients are not subjected to imaging of the thorax when there are no clinical signs. The clinical significance of pulmonary cement embolism is controversial. Most cases of pulmonary cement embolism seem to be asymptomatic. However, a growing number of reports list symptoms ranging from chest pain and dyspnea5,10,11 to acute respiratory distress syndrome12,13 and even death.6,7,14 The incidence of pulmonary cement embolism may increase further with the growing number of vertebroplasty interventions. However, the potential cardiovascular consequences of cement embolism have not yet been investigated in detail. Therefore, the aim of the present study was to investigate the cardiovascular changes after pulmonary embolism of PMMA cement with and without hydroxyapatite, with the use of an animal model. Experiments were carried out at the Biologic Research Facilities of the Prince Charles Hospital in Brisbane, Australia, using 13 skeletally mature mixed-bred ewes (mean age, 6.9 years; mean body weight, 39.0 kg) that were subjected to intravenous injection of bone cement. Experiments were approved by the Queensland University of Technology Animal Ethics Committee and were conducted according to National Health and Medical Research Council (NHMRC) guidelines. Preparation of Animals and Monitoring. Anesthesia was induced (bolus of 150 mg per sheep) and maintained (1.0 g/h) with propofol. Analgesia was achieved by administrating buprenorphine (0.01 mg/kg). The trachea was intubated and the lungs were ventilated with oxygen (10–12 mL/kg) using a Campbell anesthetic ventilator (Ulco Engineering, Marrickville, NSW, Australia), maintaining normal end-tidal and arterial CO2 tension before cement injection. Ventilation settings were not altered after injection of the cement. A drip infusion of Hartmann solution was maintained at 4 mL/kg/h. Probes were placed on the skin for electrocardiogram (ECG) conduction. The left carotid artery was cannulated for measuring arterial blood pressure and taking arterial blood samples for blood gas analysis. Central venous pressure was measured in the right jugular vein, and the left jugular vein was cannulated for measuring pulmonary arterial pressure. Catheters were connected to pressure transducers (Marquette Tramscop 12C; Philips Medical Systems, North Ryde, NSW, Australia) via saline-filled pressure tubing. Left fifth-interspace thoracotomy was performed for placing an ultrasonic flow probe (Transonic Flowprobe 20A803; Transonic Systems, Ithaca, NY) around the pulmonary artery for measuring continuous cardiac output with a small animal blood flow meter (T206; Transonic Systems). Cardiac output, blood pressures, and ECG were digitized at 100 Hz using a MacLab A/D converter (ADInstruments, Castle Hill, NSW, Australia) and stored on a computer for off-line analysis (Chart 5; ADInstruments). Heart rate was derived from the ECG. Cardiovascular parameters were recorded continuously until 60 minutes after starting the cement injection. Data were analyzed for 2-minute periods at each time point (before injection and every 10 minutes after injection) and averaged. Arterial blood samples were drawn 5 minutes before cement injection and 10, 30, and 60 minutes after injection for blood gas analysis and evaluating the coagulation status. An additional blood sample was taken before induction of anesthesia (ie, before cannulation) for measuring coagulation parameters. Blood gases were measured immediately after sampling. Blood samples for measuring coagulation parameters were centrifuged (15 minutes at 1000g, 0°C) immediately after sampling, and the plasma was stored at −70°C for later batch analysis. The following coagulation parameters were measured: antithrombin and D-dimer. Plasma samples were analyzed at a certified clinical hematology laboratory. Antithrombin concentrations were determined using a functional activity assay (Coamatic Kit; Chromogenix, Instrumentation Laboratories, Lexington, Mass). A latex agglutination immunoassay (HemosIL Kit; Instrumentation Laboratories) was used to determine D-dimer concentrations. Quantitative measurements were performed on an automated coagulation analyzer (ACL Futura; Instrumentation Laboratories). Cement was injected into the pulmonary trunk through a venous catheter (Jelco; diameter, 1.63 mm; length, 32 mm; Medex, Carlsbad, Calif). The injection location was chosen to ensure that the total volume of injected cement was carried into the lungs. The quantity of injectable cement was determined by the volume of the catheter (0.3 mL) plus the volume (2 mL) of cement that had caused 50% lethality (LD50) after pulmonary embolism in a previous animal study (calcium phosphate cement injected in pigs).19 Thus, a total of 2.0 mL of cement entered the bloodstream. The viscosity of the cement at injection was as required for clinical application (ie, vertebroplasty). Two different materials were tested, and manufacturers’ guidelines were followed: 1) standard PMMA cement containing 10% barium sulfate by weight (Simplex P; Stryker, St Leonards, NSW, Australia) was mixed for 30 seconds and left to polymerize for 90 seconds before injection. Cement was injected over a period of 10 seconds. 2) PMMA cement, containing 10% hydroxyapatite and 25% barium sulfate by weight (PMMA & HA; Vertecem, Synthes, Oberdorf, Switzerland) for enhancing radiopacity, was mixed for 60 seconds and left to polymerize for 360 seconds before injection. Cement was injected over a period of 30 seconds. Variations in mixing and polymerization times (ie, time from mixing to injection) and duration of injection were a result of the different curing properties of the 2 materials. At the end of the protocol (60 minutes after injection), animals were euthanized by an overdose of barbiturates. Changes in recorded parameters were calculated as the difference between the baseline value (before injection) and the value at each time point. Data were calculated and presented as mean ± SD and as 95% confidence intervals (95% CI). If the 95% CI did not include zero, the null hypothesis was rejected with P < .05. Comparisons between the 2 material groups at baseline and at time points with significant changes were achieved with use of the Mann-Whitney test. Post hoc power analysis was performed for mean pulmonary arterial pressure and mean arterial blood pressure. A P value of < .05 was considered significant for all analyses. Statistical analyses were performed with the use of Statistica 7 software (StatSoft, Hamburg, Germany). One animal went into atrial fibrillation during catheterization. Chemical (50 mg lidocaine intravenously) and electrical cardioversion were unsuccessful. The animal went into ventricular fibrillation and cardiac arrest and subsequently died. No animal died after the cement injection. Baseline cardiovascular data recorded before cement injection are presented in Table 1. There were no statistically significant differences between the material groups before injection. One minute after having started the injection, mean pulmonary arterial pressure had increased significantly by 9% (+2 mm Hg) and 14% (+2 mm Hg) from the baseline (preinjection) value in the PMMA and PMMA & HA group, respectively. No other changes were observed immediately after cement injection. Mean pulmonary arterial pressure stayed elevated in both groups for the duration of the experiment but did not increase further (Fig 1). In the PMMA & HA group, the increase in pulmonary arterial pressure was no longer statistically significant 30 minutes after injection and thereafter. In the PMMA group, cardiac output was significantly lower at 30 minutes (11%) and 60 minutes (16%) after injection compared with the baseline value. Furthermore, heart rate was significantly lower (6%) at 60 minutes after injection. There were no other statistically significant changes and no significant differences in the cardiovascular values between the 2 material groups after injection (Table 2). Mean changes and 95% confidence intervals of pulmonary arterial pressure after the injection of PMMA and PMMA with HA cement. * Significantly different from preinjection (P < .05). The sample size of the current study (6 ≥ n ≥ 5) was sufficient to detect clinically relevant differences (10 mm Hg for mean pulmonary arterial pressure and 20 mm Hg for mean arterial blood pressure) between baseline and postinjection values with a power of 74%–99%. Blood gas data measured before and after cement injection are presented in Table 3. There were no statistically significant changes from preinjection to postinjection values and no significant differences in the values between the material groups. There were no significant differences between precannulation and preinjection values. A decreasing trend (not significant) of concentrations of antithrombin was observed in both groups. Values dropped from 0.69 ± 0.07 and 0.71 ± 0.10 U/mL before injection to 0.65 ± 0.06 and 0.68 ± 0.12 U/mL 60 minutes after injection in the PMMA and PMMA & HA groups, respectively. No D-dimer results were available for the PMMA group because most plasma samples were hemolytic. There was an increasing trend of D-dimer concentrations in the PMMA & HA groups, which was not significant (from 0.58 ± 0.22 mg/L before injection to 0.62 ± 0.25 mg/L at 60 minutes after injection). 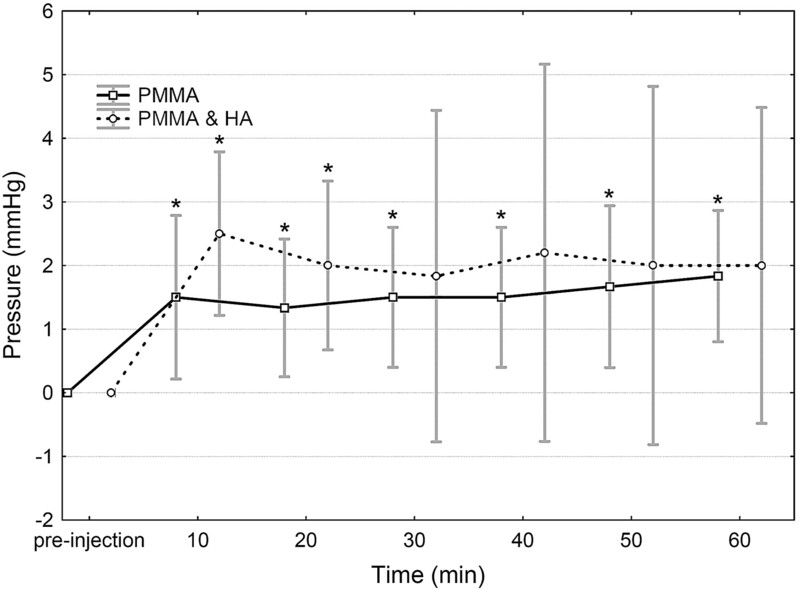 Intravenous injection of cement (2 mL) resulted in a sudden (1 minute after injection) and slight (2 mm Hg) increase in pulmonary arterial pressure in both the PMMA and the PMMA & HA groups. Pulmonary arterial pressure stayed elevated but did not increase further for the duration of the experiment. An increase of 10–15 mm Hg (67%–100%) in pulmonary arterial pressure is considered mild pulmonary hypertension in humans.22 In the present study, pulmonary arterial pressure increased by only 2 mm Hg (9%–14%). Pulmonary cement embolism did not cause severe cardiovascular deterioration in sheep with a healthy cardiopulmonary system. However, pulmonary arterial pressure stayed elevated for the duration of the experiment (60 minutes after injection). Persisting increase in pulmonary arterial pressure, though small, may worsen with time as a result of the release of vasoactive mediators such as endothelin. Endothelin is a very potent pulmonary vasoconstrictor and stimulates the proliferation of smooth muscle cells and fibroblasts.23 Thus, pulmonary cement embolism may cause more severe cardiovascular deterioration in the long term. Present results are in accordance with most clinical case reports of mild respiratory insufficiency after cement embolism. However, there is the potential of severe and even fatal complications after cement embolism, especially in patients with an impaired cardiopulmonary system. Adding hydroxyapatite to PMMA cement did not alter the cardiovascular response to pulmonary embolism compared with standard PMMA cement. There was no significant difference between the recorded values of the 2 groups. Concerns about coagulation activation because of calcium ions leaking from the cement or by the rougher surface of the PMMA & HA cement were unsubstantiated. No significant changes in coagulation parameters were observed in the present study. The slight changes may have occurred as a result of cannulation and blood sampling. There was no evidence of thromboembolism. However, higher (>10%) concentrations of hydroxyapatite may activate coagulation. Present results are in accordance with Blinc et al,24 who reported that PMMA did not activate coagulation in vitro. Pulmonary hypertension, arterial hypotension, hypoxia, and hypercapnia are the hallmark symptoms of pulmonary embolism. In the present study, only pulmonary hypertension was observed. It was not severe enough to cause significant changes in arterial pressure, cardiac output, and blood gas values. A higher increase in pulmonary arterial pressure would result in forward failure of the heart with a subsequent drop in arterial blood pressure and decrease in cardiac output. Increased dead space ventilation and ventilation-perfusion inequality would lead to hypercapnia and hypoxia. Different causes have been proposed for the increase in pulmonary arterial pressure after pulmonary embolism (ie, mechanical blockage,25,26 reflexive vasoconstriction of pulmonary vessels,25,27 release of vasoactive mediators,28,29 an allergic reaction to the material,30 or activated coagulation19,31). Activation of the coagulation cascade did not seem to play a role in the present experiments. It is unlikely that an allergic reaction caused the observed cardiovascular changes because all animals responded similarly to the injection. The present study did not investigate the potential release of vasoactive mediators. However, one would expect that the release of vasoactive mediators would have a generalized effect on the lung vessels, causing pulmonary hypertension of a higher magnitude with subsequent arterial hypotension and hypoxia. The degree of pulmonary hypertension after mechanical occlusion of the pulmonary arterial vascular bed depends on the size and number of emboli. If the diameter of the emboli is larger than 200 μm (macroemboli), blockage of more than 50% of the pulmonary arterial vasculature is necessary to cause clinically significant pulmonary hypertension.26,32 Smaller emboli (microemboli of <200 μm) initiate pulmonary vasoconstriction, resulting in a considerable increase in pulmonary arterial pressure, even if less than 50% of the pulmonary arterial vasculature is blocked.27,33 In the present study, the slight increase in pulmonary arterial pressure may have been a result of redistribution of blood flow after macroembolism, blocking less than 50% of the pulmonary arterial vasculature. Differences between the animal model and the clinical situation pertain to the limitations of the present study. Cement was injected directly into the pulmonary trunk and did not enter the bloodstream through the basivertebral veins. Transport of the cement by the bloodstream via the vena cava and right heart into the lungs may increase the risk of coagulation activation. However, generating pulmonary cement embolism by injecting cement into a vertebral body would have caused several problems. It would not be possible to control the location of cement leakage. Cement may leak into epidural veins or end up in the external vertebral venous plexus without being transported into the lungs. In addition, it would be impossible to control the quantity of embolized cement. Furthermore, cement injection into vertebral bodies would give rise to fat embolism34 and would thus mask the cardiovascular reaction to cement embolism. In the present study, cardiovascular parameters were monitored for 1 hour after the cement injection, which should have been sufficient for detecting an activation of the coagulation system. No information is available concerning the volume of pulmonary cement emboli in the clinical situation. The present study did not intend to determine the safety threshold for cement embolism but aimed to investigate the cardiovascular consequences of a substantial cement leak. Bernards et al19 reported a very high mortality rate (up to 86%) after embolism of 2 mL of calcium phosphate cement; thus, 2 mL were injected in the present study. With the present model, higher quantities of cement may have caused more severe reactions, but this was outside the scope of this study. Finally, experiments were carried out in sheep with a healthy cardiopulmonary system. Pulmonary embolism of 2 mL of cement may cause more severe cardiovascular deterioration in patients with an impaired cardiopulmonary system. Cement embolism during vertebroplasty should be prevented by all means, but the acute cardiovascular consequences of considerable PMMA leaks (2 mL) may not be severe in persons with a healthy cardiopulmonary system. Adding hydroxyapatite (10%) to PMMA cement did not cause more severe cardiovascular changes. Further studies are needed to investigate the long-term consequences of pulmonary cement embolism. We thank Dr. Sadahiro Sugiyama and Kimble Dunster for their technical assistance. We also thank Dr. André Busato and Dr. Marcel Zwahlen for their statistical advice. Dr. Hans-Peter Kohler offered his expertise on coagulation parameters. This study was supported financially by a grant from Synthes GmbH, Switzerland and AO Foundation, Switzerland. Bernards CM, Chapman J, Mirza S. Lethality of embolized Norian bone cement varies with the time between mixing and embolization. Annual Meeting of the Orthopaedic Research Society, March 3–7,2004 , San Francisco, Calif.
World Health Organization (WHO). Primary Pulmonary Hypertension. Executive Summary from the World Symposium on Primary Pulmonary Hypertension 1998 , Evian, France. Accepted after revision October 3, 2006.